We all need to work together to ensure the health of our watershed by using chemicals wisely and sparingly. 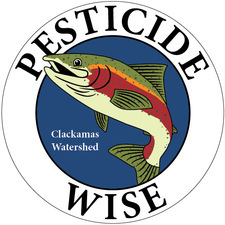 Pesticides have been found in water samples collected from the Clackamas River and its tributaries. You can help prevent more pesticides from reaching the river by making a declaration to reduce or eliminate the use of pesticides on your yard and property! As a resident in the Clackamas Watershed that cares about protecting water quality for people, fish, wildlife, drinking water and pets — here’s your chance to take the Parting with Pesticides Pledge! Get a FREE yard sign in honor of your commitment, letting neighbors know that your yard is healthy and safe. Take the pledge today and help ensure the safety of all the inhabitants of our watershed!